Too bad because it really is a great phone! The sad part is HTC doesn't have much of a presence in mobile stores or in retailers. This isn't helping their name recognition. I've had zero issues with the buttons! I've had tons of button issues since my second or third day with it, but only the VOL- button. The PWR and VOL+ buttons work fine. The issue is actually that when any pressure is applied to the back of the phone, it senses that as pressure on the VOL- button. It's easy to work around once you recognize what is happening, but an $850 (I got the 128GB blue) shouldn't need a work-around. It gets annoying when you are on a call holding the phone to your ear or holding it in landscape while playing a game or watching video, or having it in your back pocket while listening to music. I know there is an update out now that seems to really correct these issues, but it hasn't hit mine yet. Other than that, I love the phone. Pictures and video are fantastic, battery life is ok (not as great as it could be) and the screen is crisp and bright. It's a shame b/c it's a great phone, and I've had 0 issues with mine. I wish the battery life was a bit better, but other than that I love it. I haven't had any "button" issues either. Really the only issue I've had with the buttons is the placement of the power button feels a little low so it makes it difficult for me to do the double tap for one handed mode. I watched Alex Dobie's (AC writer) re-review post button update and he says it make the phone completely usable again. He now recommends this phone. So now I want to try it out since the buttons are supposedly fixed. Update is available now in US. Downloading now from Chicago. Did you purchase it via HTC.com or did you get it somewhere else? I'm tempted to go take a look at one but not sure where they are being sold. Purchased (financed) from HTC directly. If purchased from HTC you have a 30 day no question asked return policy. I returned the solar red U11 and had no problem returning or getting a refund. Ordered the sapphire blue instead. yeah, unfortunately, when I got the U11 from their website and returned it, it took me almost 2 months to get my money back. I payed with paypal and almost opened a dispute but kept being patient but on top of them to return the money. I won't buy from their website again. I was hoping to find a good 3rd party site. Amazon is fine, but they only have the 64GB Ceramic Black in stock. Neither size of the Translucent Blue, though they do have some overseas dual-SIM versions sold by third parties. They also have some warehouse deals/returns that can save a pretty good amount of money. That's where I got my 64GB blue after waiting for new ones to get back in stock. It doesn't even seem they'll be restocking the 64GB blue, and the 128GB blue has been out of stock for a few weeks. I've always loved HTC. It's awful that they do not have a more "retail" presence. I'd like to think it's because everyone is enjoying their great phone. I'm still trying to figure this out. Haha. 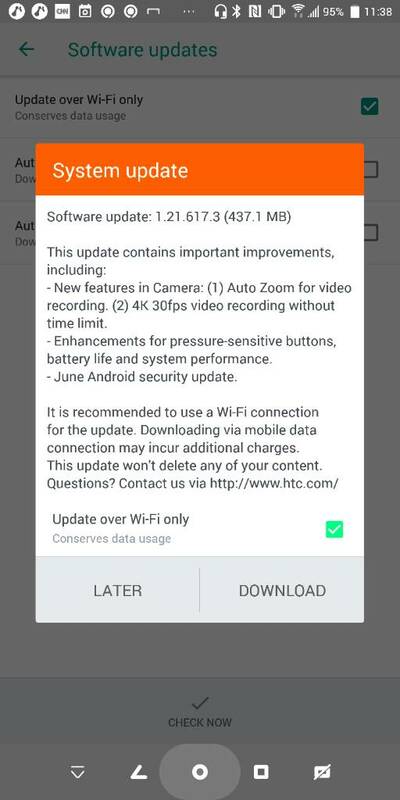 Still on the June security update??? HTC was always one of the brands widely seen even in stores back when smartphones were nascent. People would have seen their logo in many places back then, so how can it be said that HTC "is not a known brand"? I think the times have changed since then. Pretty much if it isn't an Apple or Samsung it is an unknown (relatively speaking) brand and would get little to no attention/consideration from the average consumer. That appears to be what the smartphone market has been reduced to. I think HTC is definitely an obscure brand in the big picture nowadays. Just my 0.02 of course. I do think you have a point. I think it also has to do with the fact that many phone consumers do not know the other brands out there; and go to phone stores/kiosks and sales reps (who get commission on the most expensive phones - Apple, Samsung) push the "most popular/expensive" and influence their purchasing choice. I'm not saying these purchasing choices are wrong - my brother and my in-laws use iPhones and my mom has a Samsung phone - but I am saying that a lot of people just want something that "works" and is well-known; and don't always do the research to see the other great options out there. It's kind of a mixed bag. Then there are those of us who do hours and weeks of research and get different phones from different brands. I love HTC and really wanted an HTC U11. I also remember being fascinated by the M7/8. It's too bad that this is happening to HTC. The general consumer is a sheep and pays no attention to anything other than what their friends have. Is there a new flagship from HTC this year or are they dead officially? I've been waiting for any kind of information on an upcoming HTC flagship; but I've seen nothing as of yet! Hopefully we hear something soon! What kind of error is S6?